The NBA Finals are in full-swing right now, with only the Spurs and Heat left to battle for this year’s championship. But more importantly to internet-types like me, how do these teams compare in their social media marketing? A sports team is a dream client for any social media manager, as they already have fans built-in! We’ve compiled an infographic in a play-off tree style layout to show which NBA teams have the most followers across each of the major social networks. As you’ll see below, the Los Angelas Lakers dominate on almost every social network. 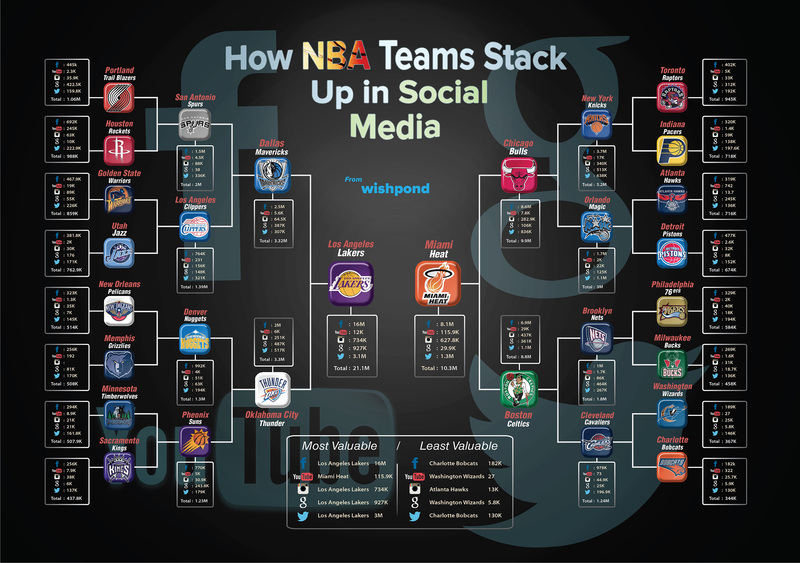 The following infographic shows how many followers each NBA team has on Twitter, Instagram, YouTube, Facebook and Google +. Which teams do you follow online? What is your favorite content that they post? Let us know in the comments.